Some of you may not know who I am, but I have to say that New England is my adopted home. I spent my high school years here, graduating from private school next to Lake WInnipesaukee in Centre Harbour, New Hampshire and went on to a Connecticut minor seminary. My wife and I have done my family tree this last year thanks to the internet, and my ancestors originate from both Maine and Connecticut, Cumberland, Maine and Fairfield, Connecticut specifically, in 1770. My ancestors then moved to Saint John, New Brunswick in the early 1800s. We currently live and work from Calais, Maine. I am going to speak to you about something that is a great dilemma affecting our world -- and especially the news business -- over the last decade, to do with the onset of social media. Fake news. I have been told many times that it's a loaded word, but really it was warned about in the mass media by President Obama in a speech in which he mentioned that we need to better curate our news. So it is not a partisan word, as the truth is the goal and should be regardless of political affiliation. Sheryl Atkinson, a former CNN anchor whom I respect and admire, has been ringing the alarm bell on the disintegration of checks and balances in newsrooms today. She brought attention to the term “Astroturf," which refers to the deliberate obfuscation of the source of a report or article online, most frequently, a biased, self-interested party paying for the content to be broadcasted online and elsewhere. We are in the middle of a technological change brought on by the ubiquitous use of smart phones and social media, phones that allow the sharing of news with a few clicks of a button. Whether or not the news is true is usually not the first concern we have before we share, and this is a problem in my view. In a recent Pew Research poll on news consumption, TV remains king at 75 percent. In the 18-49 year old demographic, digital consumption of news shows that 76 percent consume online, and 8 percent still read newspapers, the physical product for their news. 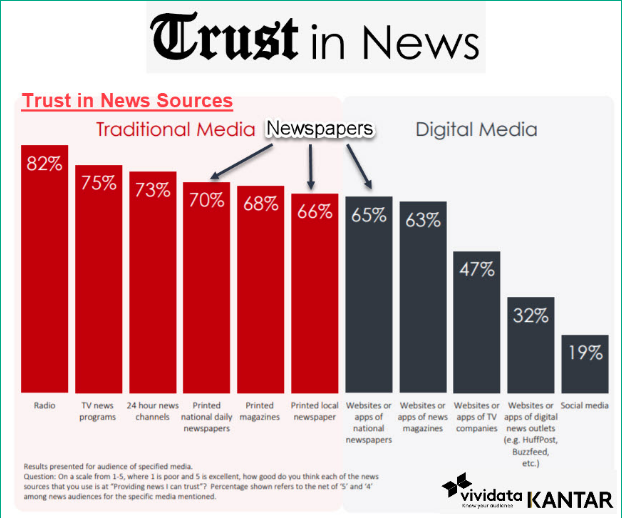 The trust in printed news is still quite high, but our readers are being eroded away by a new medium that claims to be the way of the future, but leaves the truth behind. What kind of future will this be? I would suggest it would be a more polarizing one, and one that is fraught with miscommunication, confusion and discourse based upon false assumptions. I have said it a few times before -- the news editor must be a watchmaker of truth, the horologist of truth and a newspaper, the precision watch piece. In both a newsroom and a watch there are many unseen moving parts. News is like time -- everyone wants to know the time but few reports are accurate without a standard. A newspaper is that standard, private capital put to work to establish the truth of the matters affecting our communities. That is why it shares constitutional protections under the FIrst Amendment. By buying a news subscription and using the local community newspaper for your advertising and promotional needs online or in print, you help our newsroom employ reporters and journalists right here in your local community. Surprisingly, we spent $100,000 in wages for newsroom and correspondents to cover the news in Washington County in 2018. Facebook on the other hand, doesn’t have any reporters, editors or writers in our community. Even so, the business community might be tempted to advertise solely with them at the expense of traditional newspapers. When you do, your ad dollars are being spent out of county and go up the telephone pole to San Jose California, on a perceived understanding that Facebook advertising is better because you can target more effectively and receive reports about click-through. It all doesn’t work if those metrics you receive from Facebook are actually untrue. Which is actually the case. Facebook has been caught numerous times faking metrics with advertisers. Sources: Facebook ad fraud and lawsuits and 2) fake clicks, click bait and have been involved in security issues with bots and malware. Online experiment finds that less than 1 in 10 people can tell sponsored content from an article, according to Kat J. McAlpine of Boston University. My talk will be posted on machiasnews.com if anyone would like to have links to my sources. The most obnoxious case of fake online news activity in my opinion was right here in our back yard in North Waterboro, Maine, and was reported on by the Washington Post November 11, 2018 with a story titled, “‘Nothing on this page is real’: How lies become truth in online America” published. This is a story about a man in North Waterboro who sat in front of his computer with multiple monitors, quit his day job and did nothing but create fake images and fake headlines all day, mostly political satire, and posting them to Facebook and instagram to then receive click throughs back to his article website where he was collecting advertising revenue. Revenue in the thousands per month. He received 15,000 per month on a month with his best lies about political candidates during the 2016 Presidential election. So you see there is a moral hazard here. Bad behaviour and “outright lies” are being incentivized with cash, and that is the reason for fake news online. What can you do about it? For news online I would suggest stop hitting that share button too quickly, unless you know it’s from a reputable source and respect the outlet. As a general rule nothing is actually authentic, unless it links back to the actual newspapers domain name. If it's not, it can be tampered with and it is generally regarded as untrustworthy. I am involved in a deeper research and business project regarding the notarization of sourced news, and it is the future in our highly computerized world of news on the internet. So the problem really is one of a computer science problem and tools are being built now to protect our personal data and hopefully, you will see some of my technology being used in the future in truthful sourced authentic news. We are in a hard fight, no doubt. And finally, I would like to close on a positive note that the business community here in Machias and Downeast in Calais have supported the Machias Valley News Observer and the Calais Advertiser tremendously and for that I am grateful, and I thank you for your support and hope you continue to see the value in supporting our newsroom by subscribing and advertising within our pages. And with that I am open up for questions.